Take a guess: During which of these time periods, the Dark Ages (500-1500 AD) or the industrious world of the 20th century, did children’s health suffer the most? If you guessed the 20th century, then you’re right. In their article, The Not-So-Dark Ages: Ecology for Human Growth in Medieval and Early Twentieth Century Portugal as Inferred from Skeletal Growth Profiles, Dr. Hugo Cardoso and Dr. Susana Garcia found that child labour practices of the early 20th century stunted growth. Around the age of 12, children were typically sent to work in factories where conditions were harsh. Left under the care of their masters, malnutrition and disease were commonplace. During Medieval times, however, children were involved more dominantly with familial and household obligations and were cared for by their family. So, it turns out that Medieval Europe wasn’t such a shabby place to raise children! Here in Canada, child labour is not a problem, but our children’s growth may suffer for other reasons, like lack of physical activity, poor nutrition and imbalanced diets. 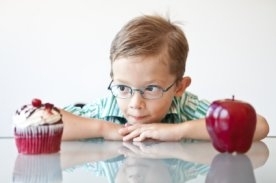 Processed foods and sugary foods are especially targeted at kids. The result is the increasing epidemic of childhood obesity and associated illnesses like diabetes and heart disease. Here’s a scary number: 70 million. According to the World Health Organization, that is the estimated number of children who will be obese or overweight by 2025 across the world. Canada is no exclusion to this problem. Compared to the 1981 Canadian Fitness Survey, Statistics Canada found that children and youth from 2007-2009 had a higher % of overweight and obese individuals, increased waist circumference, and reduced muscular strength and flexibility. As Albert Einstein once said, “We cannot solve our problems with the same level of thinking that created them”, so we must think outside the box to conquer the obesity epidemic. Here we’ve done some of the thinking for you. Conquer the scary stats and keep your kids in tiptop shape by following the tips below. Start with reducing your child’s sugar intake and consumption of processed food and replace it with foods from all four major food groups: 4-6 servings of fresh fruits and vegetables; 3-6 servings of grains like quinoa; 2-4 servings of milk products like yogurt; and 1-2 servings of meat. Consult Canada’s food guide to find portion suggestions appropriate for your child’s age. It can be difficult to completely eliminate your child’s favourite juice from your shopping list. So if elimination is problematic, start with substitution. Serve small portions of 100% fruit juice instead (with no added sugar). For additional help on how to practice good eating habits, here are some additional tips courtesy of the Dietitians of Canada. The link between physical inactivity and obesity is no joke. Research shows that children who were engaged in sedentary activities like TV watching and video gaming for prolonged periods were more likely to be obese (10–61% increased risk). Restrict the time your children spend in front of the television or gaming console to no more than two hours per day. The Canadian Health Measures Survey (2007-2009) estimated that only 9% and 4% of boys and girls, respectively spent at least one hour engaged in moderate-to-vigorous exercise six days out of the week . To start off, aim to keep your child on their feet doing something that will produce sweat for at least 30 minutes every day. Keep your kids preoccupied with fun activities after school. Another superb resource for parents is Help! We’ve Got Kids. The above research also showed that boys tended to be more active than girls – on average, boys took about 2000 steps more than girls. So keep in mind that your daughter may need more encouragement and motivate her to participate in physical activities. Canadian parents need to be especially attentive towards the way their kids spend their weekend. In a study that compared Canadian and Kenyan children (ages 9 to 11), both groups showed similar activity levels during the weekdays, but Kenyan children were far more active during the weekends compared to their Canadian counterparts. Save some of the activities discussed in Tip #3 for the weekends. As the number of electronic screens increased in a child’s room, so did levels of body fat (adiposity) . More screens mean more screen time and consequently reduced sleep efficiency. Researchers found significant differences in body fat between children who had a TV in their rooms compared to those who did not. Interestingly, such a difference was not noted in bedrooms with computers. So ditch the TV! One study reported that adolescents (12-19 years) who cycled for at least an hour per week were more fit and had lower BMI, waist circumference, and total cholesterol / high-density lipoprotein (good cholesterol) ratio compared to non-cyclers. Cycling surpassed walking as the superior form of transportation most suitable for leading a healthy lifestyle. Incorporate cycling into your child’s fitness regime as an alternative to commuting or driving. In the above-mentioned Canada-Kenya study, researchers found moderate to vigorous levels of physical activity in Kenyan children of low socioeconomic status. Surprisingly, children higher up the social ladder weren’t as active. The message here is don’t spoil your children with fancy gadgets and limit their imaginations. Being tech-savvy is a must for modern kids, but four-year-olds don’t need an iPad! In opposition to Tip #8, researchers from Queen’s University found that amongst Canadian adolescents living in low socioeconomic conditions, decreased wealth meant a decline in physical activity . Further support for this is seen in a Montreal-based study on children from multi-ethnic, low-income families, where obesity rates soared over a period of 5 years . This may be due to the reduced availability of affordable recreational activities, but don’t let that stop you. Your local community centre is the easiest way to access fun (and sometimes free) activities. Wintertime programs include skating, winter aquatics and March Break camps. The growth charts brought to you by the World Health Organization is an excellent tool to help you assess your child’s growth. If you’re bit confused by all the numbers and curves, talk to your family doctor; chances are high that they are already familiar with it. Buy an electronic scale for use at home and monitor your children’s weight. You can use a BMI calculator to assess your child’s weight category (i.e. underweight, normal, overweight, and obese). However, this tool should be used with caution for children and youth since young people haven’t finished growing. Attention Toronto Students: Eating Healthy Starts Now!